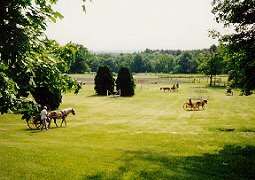 Ingate Farms, near Amherst, in western Massachusetts and nestled in its own cool wooded valley, operates a Bed & Breakfast Inn, Equestrian Center, children riding day camp and has an Olympic sized swimming pool on its own 500 beautiful acres. It is minutes from the beautiful Quabbin Reservoir - one of New England largest bird, animal, and water preserves or any one of the five colleges: Smith, Holyoke, Amherst, Hampshire and U. Mass. Guests can ride horses & bikes, swim, hike, picnic, fish, take riding lessons and board their own horses short or long term. 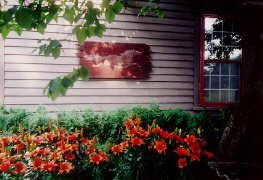 The 250 year old antique furnished Bed & Breakfast Inn provides five lovely bedrooms plus fireplaced living and dining rooms. Bedrooms are individually heated or cooled. Restaurants, educational and additional recreational cultural opportunities abound nearby. Rates: $60 - $90 per night (D.O.) including healthful buffet breakfast. Call or fax for extended-stay corporate, or whole-house rates for fmaily events. 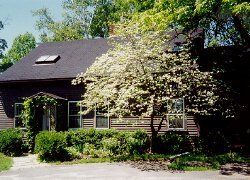 This and other Amherst Bed and Breakfast Inns can be found here in The Register.